Note: Any oven-safe, straight-sided dish with a 2-cup capacity will work well for this recipe. You can also vary the recipe by using 3 Tablespoons of a finely chopped cooled green vegetable, sautéed mushrooms, or minced ham, in which case only use 1 Tablespoons of grated cheese, like Swiss, in addition to the Parmesan. Cover the inside of two smaller individual serving size ramekins or soufflé dish with ½ teaspoon of softened butter and sprinkle the Parmesan over the buttered surfaces. Preheat the oven to 425°. In a small cooking pot, melt 2 teaspoons butter and stir in the flour. Cook this gently over low heat for just a minute, and then remove it from the heat. Pour in the milk, whisking rapidly, and return the pot to medium-low heat to simmer for another minute, stirring constantly as the sauce thickens. Season this with salt and paprika. Remove from heat, and whisk in the egg yolk. Put the egg whites in a clean bowl and beat until soft peaks form. Add a dollop of egg white to the butter, flour and milk mixture along with about half of the grated cheese. 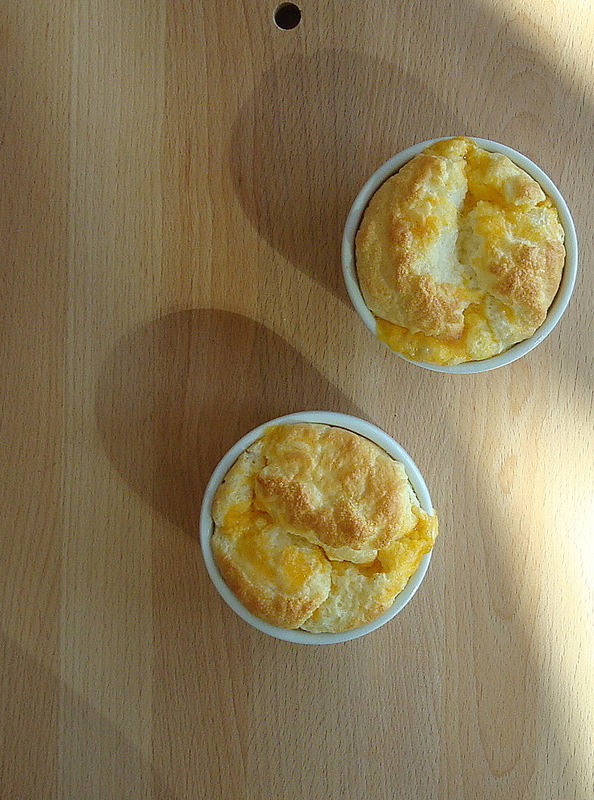 Then gently fold in the reaming egg whites and cheese; transfer everything to the prepared ramekins or soufflé dish. Place on a baking sheet, and set it in the middle of the oven. Turn the heat down to 375° and bake 18 minutes, until the soufflé has risen and the top is lightly browned.